Odds are, whether you’re brand new to the vaping community or have clocked some serious vape time and consider yourself a pro, you’re interested in new ways to personalize your vaping experience. After all, you're not downgrading from a traditional cigarette—you're upgrading. Gone are the days when your only option was your cigarette brand; now, the world of vaping offers near-endless highlights like high smoke volume, thousands of juice flavors, adjustable nicotine levels and many different vape devices in all sizes, styles, and colors. With options like these, you can truly customize your vape experience and take it to an entirely new level. Here are a few ideas for customizing your electronic cigarette in a variety of ways. Apart from the freedom to vape in public, vaping appeals to many smokers because of the affordability and the ability to customize the experience. There are many ways to trick out your vape, let’s start with a few basics. The tip (mouthpiece) that is puffed on by the smoker. The battery that powers the device. An atomizer that heats up the flavored e-liquid and vaporizes it. A cartomizer - a tank that holds the e-liquid and the atomizer. Many vape devices have cartomizers in different colors that give you high vapor production and an exquisitely smooth hit. There is also a wide range of long-lasting batteries that come in colors like black, purple, red, blue, green, white and even rainbow. Choose from drip tips in eye-catching swirl patterns, metallic colors, and many different shapes. Many of these customizable elements don’t just change the way your device looks, but also how it functions. You can create a device that’s perfectly tailored to your vape preferences, whether you’re a cloud chaser, a flavor connoisseur, or a combination of the two. Choose from thousands of vape juice flavors and options. In traditional smoking, you have two basic flavors: tobacco or menthol. For most people that smoke traditional cigarettes, the taste isn’t something at the forefront of their experience. However, vaping allows you to choose your flavor from a list of thousands, or even create a custom blend. For example, you may want to mix strawberry and chocolate for a scrumptious dessert flavored vapor. Or maybe, you wish to indulge in the decadent richness of Crazy Cuban cigar flavor to go with your favorite adult beverage. The options are endless. All VaporFi e-liquid is made in a state-of-the-art manufacturing facility registered with the Food and Drug Administration (FDA*). Also, we make our formulas using USP Grade Kosher ingredients on file with the FDA*. Propylene glycol, a food preservative. Glycerin, also used as a sweetener and food preservative. Ours is sourced strictly from Malaysian Palm and only the highest quality producers. Specially designed flavors are then added to give the vapor a taste. You also have the option of adding in a tailored level of nicotine if desired. There are different levels of nicotine concentration (ranging from 0 to 3.6 percent) available in our flavored e-liquid. VaporFi liquids can go up to 3.6 percent nicotine level—one of the highest concentrations on the market. When you choose to create a DIY custom blend, the power is all yours: mix and match up to three flavors from our huge list of tasty e-liquid to create a unique vaping experience. If you’re drawing a flavor blank, you can check out our customer reviews for custom e-liquid blend ideas. Or, if you live near one of our store locations, we invite you to sit at the Vapor Tasting Bar where you can experience the delicious array of VaporFi e-liquid flavors and learn to mix. You can also watch a video about how to fill your cartomizer with e-liquid, and visit our blog for up-to-date info on ways you can customize your vaping experience. When you choose VaporFi juices, you’ll enjoy flavors with natural fortifications, consistency and uniformity from the first puff to the last. 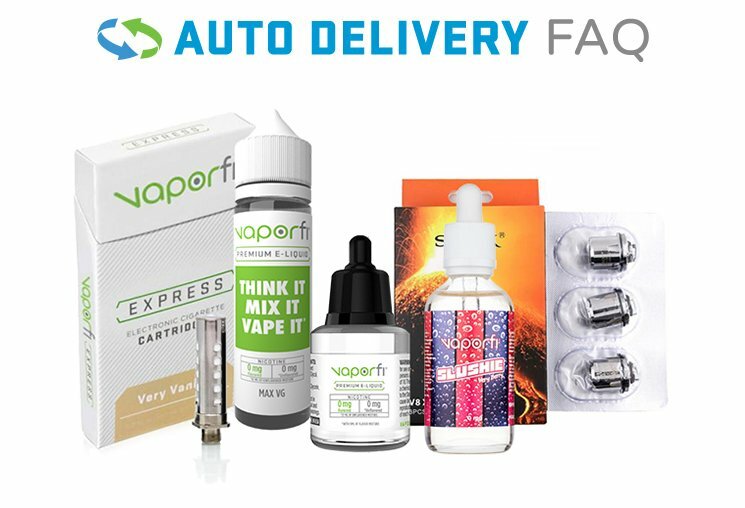 Experience the difference of VaporFi flavors and get the satisfaction you deserve. Want to keep it simple? Check out our inventory of e-liquid cartridges in single flavors. We invite you to continue browsing our website for more information about vaping and electronic cigarettes. Please feel free to contact us anytime with questions about our products or vaping in general, or stop by one of our stores to chat with one of our experienced staff members today.